The question “Who is an African?” was one of the most important and divisive questions during colonialism. It remains one of the most important questions today in Darfur and other parts of Africa. A brief background: the war between the North and South of Sudan was often reduced to a war between Christians and Muslims, or blacks and Arabs. People were asking who really belonged (and where) as well as who had claims to what-- claims to land, to Islam, to Sudanese culture and tradition, to the Arabic language. Darfur was cut along slightly different lines, but again the question was “Who is the real Darfurian?” “Who is the real Sudanese?” “Who is the real African?” "Who is Arab?" "Who is the real Muslim?" Mamdani quotes John Garang’s (the leader of the SPLA who died in 2005 after becoming the vice president of Sudan for just 12 days) 1986 speech in which he struggles with the felt need in Sudan to be "Arab": “Others get frustrated as they failed to discover how they can become Arab when their creator thought otherwise and failing to find this... they take refuge in separation." 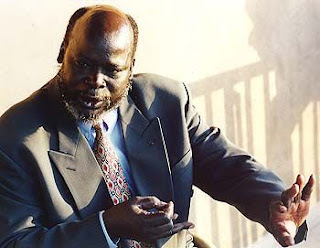 Importantly, Garang believed in one Sudan, and even in Arabic as the language of Sudan. He believed that regions of Sudan could persist without succession-- or at least, that this might be the most practical options for all Sudanese. Motivation is important. Identity is important. From Saviors and Survivors , my take away message is that, as in so many parts of Africa, identity can be constructed along destructive lines, that those lines are super complicated, and that a community never has total power over their identity. Bringing it back to our lives and our identities, the lens through which we approach other people is surely defined by our histories, our knowledge of our country or community, but also our overall belief system. Garang argued in 1986 that one takes refuge in separation- not that separation is a natural first choice. “…Today, as a country, we keep an audible silence about these ancestors of the generations that live, fearful to admit the horror of a former deed, seeking to obliterate from our memories a cruel occurrence which, in its remembering, should teach us not and never to be inhuman again. I am formed of the migrants who left Europe to find a new home on our native land. Whatever their own actions, they remain still, part of me. In my veins courses the blood of the Malay slaves who came from the East. Their proud dignity informs my bearing, their culture a part of my essence. The stripes they bore on their bodies from the lash of the slave master are a reminder embossed on my consciousness of what should not be done… My mind and my knowledge of myself is formed by the victories that are the jewels in our African crown, the victories we earned from Isandhlwana to Khartoum, as Ethiopians and as the Ashanti of Ghana, as the Berbers of the desert….